The key to a successful fundraiser is soliciting materials and time from local businesses and community residents in order to keep overhead costs low. Ask for volunteers to help in the planning stages, during the event and with clean-up. Send flyers to area businesses asking for items to use at the carnival or to auction or raffle off. Connect with an organization of local activists or civic-minded individuals to ask for help, resources and ideas. Ask a local school, church or library. They may donate a space or charge a minimal fee. Ask businesses for leftover materials for craft projects or to donate the cost of renting a “bouncy house” or to sponsor another activity. Solicit items for pot luck food or contact a local restaurant to provide a spaghetti dinner. Set up an arts and crafts station with projects for kids and adults of all ages. Ask for volunteers from a local high school arts class to guide carnival-goers through different projects and solicit materials from local businesses and neighborhood residents. How Do I Host a Cash Bash Fundraiser? Look for materials that would otherwise end up in a landfill and lower the carbon footprint of the event. Sell baked goods, snacks and beverages. Organize a cake or cupcake walk. 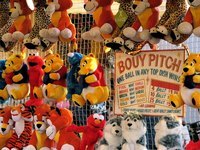 Arrange a carnival boardwalk complete with carnival games like ring toss, balloon darts, beanbag toss, bowling and three-legged races,. Sell tickets for the games at a reasonable price and offer inexpensive prizes bought in bulk or donated. Ask for volunteers from a local beauty school or art school to facilitate this activity. Set up a tent wherein guests can adorn their cheeks, bedazzle their nails or temporarily ink their limbs. Ask local clowns, jugglers, musicians, poets, comedians, theatre troupes, dancers, mimes, balloon artists and other talented performers to donate their time for a good cause. Solicit businesses and artisans for items. Raffle off a donated prize. Conduct a silent auction or host a live auction. Set-up a photo shoot and charge a small fee for the finished product. Create painted cardboard cut-outs for guests to pose with. Alternatively, set-up a background and add costumes for carnival-goers to wear. How Do I Get Yankee Tickets Donated for a Gift Auction Fundraiser?